This fascinating and clarifying look at the debate surrounding global warming explores the striking disconnect between the relatively clear-cut concerns of the world's most prominent scientists and the maze of speculation, rhetorical posturing, and outright misinformation that attaches to this issue whenever it's taken up by politicians, PR specialists, and political pundits. Mixing a localized focus on Ireland with insights from scientists and leaders from around the world, the film serves as both a primer on climate science and a penetrating analysis of media framing and the science of perception management. An excellent resource for courses in science, environmental studies, global politics, and media. Features commentary from former Irish president Mary Robinson, UN Secretary General Ban Ki-moon, paleoclimatologist Jennifer McElwain, and a host of other prominent scientists and commentators. "If you are skeptical about human-caused climate change, watch this movie. It provides a clear and compelling case for the reality of the problem and the threat to our future that it poses." 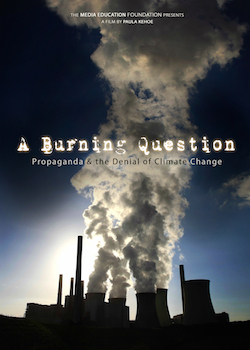 "A Burning Question picks up where An Inconvenient Truth left off, not just updating the data of climate change, but probing the disinformation and media confusion that obstruct action on civilization's greatest challenge. The setting is Ireland, but the story is the world's. See it!" "Engaging and informative. Gets to the heart of the politics of climate change, examining the relationship between the science, the vested interests, the media, and the public. Essential viewing." "Powerful and revealing. It should be seen by everyone, not just those who are already convinced about the realities and dangers of climate change." "A sober, clear, and convincing account of the science of global warming and the challenges we face in responding." "Everyone concerned about their children's and grandchildren's future should see this outstanding film. A Burning Question is balanced, scientifically accurate, and pulls no punches. Don't miss it." "Based in Ireland, this film follows an imaginary citizen who wants to unravel the conflicting views he hears about climate change in the media. With the help of some excellent authorities such as Mary Robinson and Peter Lynch at University College Dublin, he realizes that the scientific consensus around climate change is quite strong, measured, and without corruption." "This film is a really important dissection of the shifting contours of changing climates and competing media and scientific discourses. A Burning Question brings out the exceptional urgency of reversing those interlocking processes that are already transforming lives and environments across the globe." "Clearly articulates the gap between the science of climate change and public perception of that science. Watch it with a friend." "This film should be seen by everyone. It starts with the doubts and confusions of so many popular beliefs about climate change. Then, step by step, it explains clearly why more than 99% of climate scientists believe it to be real, to be mainly caused by human burning of fossil fuels, and to pose huge dangers to our children and grandchildren, unless we take action to change our ways now." "A fascinating, very clear and non-technical message, exploring both sides of the issue, leading to a strong endorsement of global climate change." "A compelling analysis both of the threat posed by climate change and of the difficulties of generating public support for measures needed to combat it." "Peels back the blanket of public confusion concerning global warming while providing a clear and compelling exposition of the basic science of climate change."